Click here for my introduction to "The Rochester Character" and here for the second addition to it. I have a fourth character to add to the jumble of Mr. Rochester from Jane Eyre, Henry Higgins from Pygmalion, and Heathcliff from Wuthering Heights. The newbie is the title character of The Phantom of the Opera. I mean him no offense by calling him "the phantom" instead of his name, Eric; it's just that most people don't know his name. Even less people than know that Sleeping Beauty's name is Aurora, I'd say. The most obvious similarity here is the controlling characteristic. Out of the four, the phantom seems the one who has the most control. The entire opera is under his control. Heathcliff only controls a couple of houses out in the country, Higgins only controls his work and everything relating to it, and Rochester acts like he's in control, but really isn't. He has a past and present with Bertha that he can't escape and Jane chooses to leave him. With the exception of self-centered Higgins, they're all exerting this control, to a degree, for a woman. The phantom sets up his elaborate scene to gain Christine, like Heathcliff wants revenge for Cathy and Rochester wants to be able to have a future with Jane. The phantom is very similar in my eyes to Heathcliff with the buried-deep good core beneath so much evil from the pain of the past. (That's a nice, wordy description, isn't it?) He, like Heathcliff, couldn't be accepted by the world, because of his appearance versus his lack of social standing. He used the excuse to cause torment to others. Christine isn't much like Cathy, though, except that they both choose another man. Christine is a better person, which is why she doesn't love the phantom back, even if she can and does pity him. It can be very hard to get my books to fit right in their shelves. Then whenever I'm happy with the way they're organized, I get a new one that messes all the order up. It's a delicate process, which I'll here describe. I don't keep to alphabetical order (not in the overall picture, at least); rather, I organize each shelf according to subject/author. Non-fiction books mostly on one shelf, classics on another, C.S. Lewis / J.R.R Tolkien together, etc. All good and well except when the categories don't match the number of shelves. Then I have to combine some, split others. After that, I try and keep similar-looking books together. The Barnes & Noble editions together, the blue-shaded spines, the tall books, the short ones. Make it all smooth and flowing. When it comes to classics that are all the same kind of edition, I do put them in alphabetical order by author's last name. Why not? Books always look a little funny if they're all vertical, too, so I keep the few on each shelf that look/fit best horizontally that way just to ease aesthetics. Then when lack of space requires and I need to start building upward, more horizontal stacks start to form. They do look nice, but they're a pain. If I just want to look at a part of a book in a stack, I have to take apart the whole thing to get to it. Not ideal. So I try and keep stacks limited to the books I'm not constantly picking back up. Like I said, a delicate process. It's no secret that I love Charlotte Bronte. So when I stumbled across this book at the bargain section in Barnes & Noble, it quite literally jumped into my hands. I had no choice but to buy it. I'd heard of the draft Charlotte left when she died, and I think I'd even heard of someone finishing the novel, but somehow I saved the information for later instead of hurrying out to find the book. Bear with me while I bounce back and forth between opinions of it. When I first took a look at it, I was a little annoyed that only Clare Boylan's name is listed as the author, even if Charlotte is mentioned on the cover. Who did this Boylan character think she was, coming over and stealing Charlotte's idea and taking all the credit? Like many first impressions, I don't feel the same way anymore. I still have trouble understanding how anyone could want to finish another person's work. Finish, not just experiment with finishing. And publish it, too. The answer is probably to keep Charlotte's voice alive, but you see, I think that every person has a unique voice no matter how hard he or she tries to imitate someone else's. Clare Boylan tried, but I can still tell so clearly that Charlotte wasn't the one to write this book. After all, there were only two short chapters in the draft. The entire plot after that is of Boylan's making. She does explain that she added some pieces of Charlotte's letters into the book to give it more Bronte flavor, but even still, I find it very different. After the first few chapters, I was rarely reminded of Charlotte. The tricky thing, though, is that even Charlotte would have made this book different from her others. It came from a different time in her life, when she had learned and experienced different things. But I still don't think it would've been quite the novel Boylan wrote. Which brings us to the big question: Is this a bad thing? I can't answer yes. Emma Brown is an absorbing read, endowed with some of the best parts of nineteenth century and modern writing. It has beautiful, original imagery that's often lacking in books today. Its social commentary is direct and while designed around a different century, can still be brought to apply to our world. That's plenty to make a worthy book. Wow, I have to admit, Mr. Webster, I'm disappointed with this definition. I was expecting a little more emotion, even for a dictionary. How about if we compare it to another word. Okay, I was right, the "home" definition is saturated with emotion now compared with this. Dictionaries are so cold . . . .
Why did I choose such a word this time? Naturally, because I'm moving this weekend and have been thinking a lot about what place I'd like to truly call home. I'm only moving two hours away, but I'm also moving from rural to urban. There are advantages and disadvantages to both, so I think I've decided that all I'm really concerned about keeping right now is Arizona. I've said before how much I love this place. It's a familiar place that I've grown used to. Small town/big city, I can get used to as long as I stay here. Which makes me think about people in past times. They didn't move around very much, minus the long travels of the wealthy. Home was always the same place. I think we can make ourselves love many places if we know that they're where we live and will live. Because it's the eyes we see through that determine what the place looks like, and it's we who fashion how those eyes see. I've been thinking a lot about parodies lately. They're a precarious thing to get right. It isn't too hard to just make someone laugh, but I like them to be better than that. They need to be more lasting. First, they have to have intelligence behind them. Whether it's about politcs or a movie, people need to show (one way or another) that they know the topic. Just having bad acting isn't enough. Then they need to be good enough that someone who likes what's being parodied can still enjoy them. This kind of ties in with the intelligence: it's so witty and well put together that you can't help but like it. Don't forget about originality, either. It should be a given, but sometimes people just fall for the obvious way of doing things. If it's unexpected, it'll make you laugh more. Naturally, I have a particular parody in mind most lately. Twilight the Musical by Gliff Productions. I've seen a few Twilight parodies, and this one outshines them all by far. The first part was a little slow for me, but the second part is just hilarious. It isn't finished yet, though, so I'm waiting eagerly for Part 4b (which is supposed to come out soon.) These guys have a strong grip on their material (the book and movie, as well as the Midnight Sun draft), always sticking in some subtle detail. Maybe it's all those layers that I like so much. 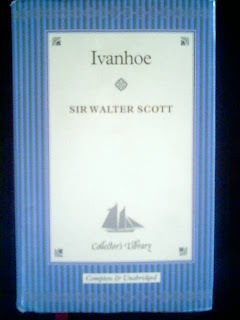 I just finished Sir Walter Scott's Ivanhoe last Friday. Interesting read. At first, I was looking at the poetry of its writing/descriptions, which in itself make it worthwhile. Then I thought about it historically. If Scott is the father of the historical novel, historical fiction has still changed very much since his time. The way he described medieval clothing or mechanisms reminded me of how C.S. Lewis talks to his readers in The Chronicles of Narnia. They both give a comparison to something the reader will be familiar with. Today, though, historical fiction seems to envelope itself in the time period. Authors don't want to remind you that there is such thing as the present day; everything they say is a part of the period. Then again, a lot of people today seem to like using a first person perspective, which eliminates the possibility for Scott's style. So that's what I was thinking about earlier in the book. That and the fact that Rebecca struck me as a much more interesting character than Rowena, despite the fact that Rowena was the one Ivanhoe loved. I was surprised to find Rebecca become even more important in the story than Rowena. No wonder the book could've been called Rebecca the Jewess. It's more about Rebecca than Ivanhoe, I think. After I finished reading, I looked a little at the controversy over the ending. And yes, I can see how people would want Rebecca and Ivanhoe to end up together, but that ending wouldn't be as powerful. In keeping with the feel of the entire novel, Ivanhoe and Rowena have to be the ones together. There's just no other way. Even if Rebecca weren't Jewish or there was no discrimination, the knight and his lady have to have their "happy ending." That it isn't completely happy is what makes it interesting. Though I still do wish that there was a way to ensure Rebecca's happiness. She doesn't need to be with Ivanhoe, I'd just love to see her with a more bright future than simply servitude.